As the daughter of an elementary-school teacher growing up, I read a lot of children's books. From the bouncy Chicka Chicka Boom Boom to attempting (and probably failing) to understand the subtext of Animal Farm at the tender age of 10, I always had a great love of reading. However, with all those books my nose was buried so deep into, one author reigned supreme in my eyes: the incomparable Roald Dahl. I loved every piece of work I'd read by Roald Dahl. I loved his dry humor, his colorful wording and the magical plot lines in each of his books and stories. Throughout my youth, I read Matilda 13 times (and yes, I was that nerdy kid who actually kept track of such things). As a person whose dream was to be a writer from the age of six, Roald Dahl was my ultimate hero. So when I stumbled across these incredibly awesome stamps recently released by the Royal Mail, I was elated. In fact, part of me wants to take up residence across the pond for a few months just so I can have the opportunity to put to use these stamps honoring my childhood hero. 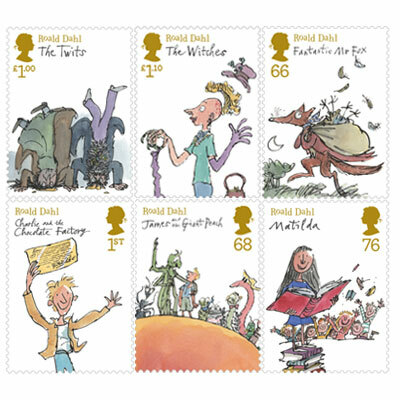 Did you love Roald Dahl as much as I did growing up? Which was your favorite of his works? It's a tie: Danny, the Champion of the World and The BFG. I always thought Danny, The Champion of the World was an overlooked work. Both are great! Now I want to go back and read his books over again.